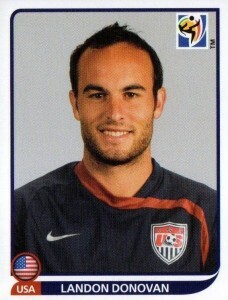 Arguably the greatest player in U.S. soccer history, Landon Donovan was the face of the sport for millions of new fans. 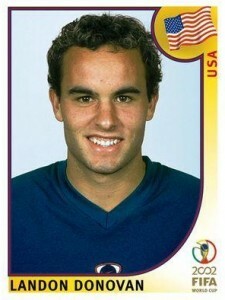 Although his career with the U.S. men's team did not end like many wanted, Donovan still went out as an MLS champion. 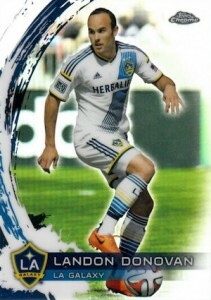 Shop for Landon Donovan cards on eBay. 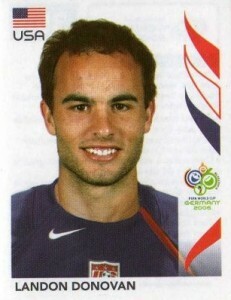 A soccer prodigy, Landon Donovan joined the U-17 U.S. National Team and was an immediate standout. He was signed by Bayer Leverkusen of the Bundesliga in 1999 but was soon loaned out to the San Jose Earthquakes of the MLS. It was here that Donovan began to establish his name in the sport on a larger scale. He made his World Cup debut in 2002, helping the team reach the quarterfinals. 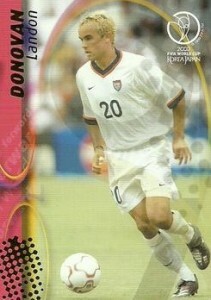 Based on his impressive play, Donovan was named the 2002 World Cup Best Young Player. Once his contract with Bayer Leverkusen ended, Landon Donovan signed with the LA Galaxy. 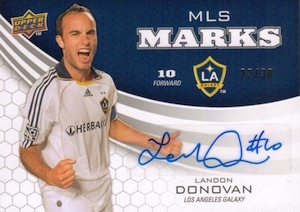 Outside of brief loans with Everton and Bayern Munich, Donovan spent the rest of his club career with the MLS and helped the Galaxy win four MLS Cups, including one in his final season. Donovan also won two MLS titles with the San Jose Earthquakes. 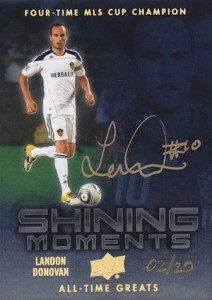 His pairing with David Beckham on the Galaxy from 2007-2012 made them the most popular team in the MLS and exposed soccer to more Americans. 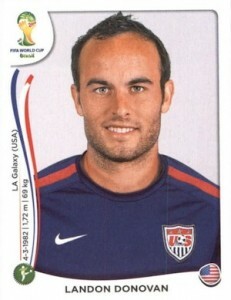 Donovan also played for the 2006 and 2010 World Cup teams. His 2010 performance is particularly notable because he helped the team win their first group stage and also scored a thrilling goal in the finals seconds against Algeria. This would ultimately be his final World Cup appearance as he was left off the 2014 team. 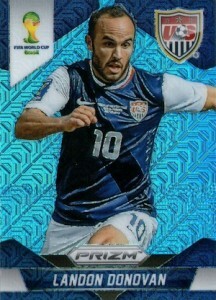 From a collecting perspective, it is important to realize that soccer cards are not as plentiful as other sports. However, there are still many cards for collectors to chase. 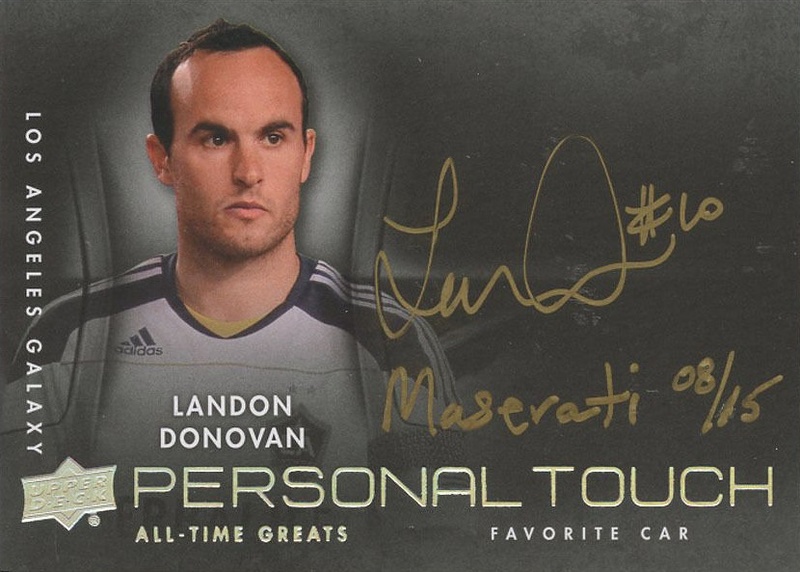 Because he is an exclusive signer for Upper Deck, autographs for Landon Donovan are somewhat limited. This further complicates things from a hobby perspective because Topps now holds the license for MLS cards and Panini owns the World Cup rights. While his worldwide appeal will never approach modern superstars of the game, like Cristiano Ronaldo or Lionel Messi, Landon Donovan has done enough for the sport to remain a fixture in the history of U.S. soccer. 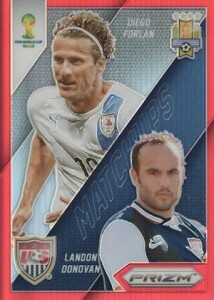 The following list looks at some of the top collecting options for Landon Donovan. Click on the listing or image to shop for singles on eBay. 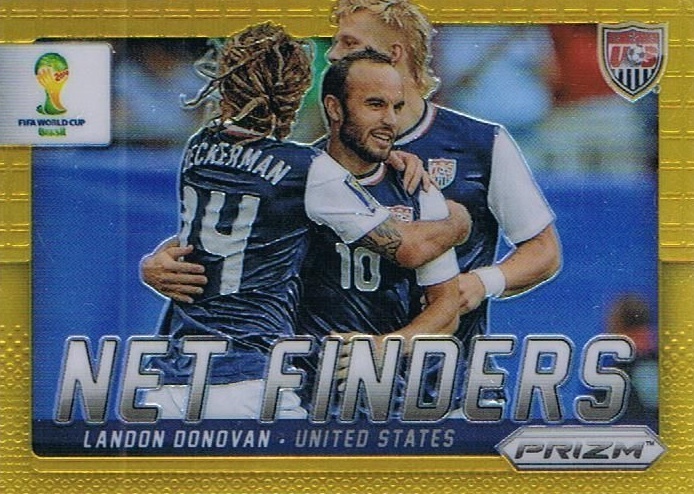 The blonde hair might be a bit jarring, but this is one of the earliest full-size cards for Landon Donovan and also a memento of his breakout performance in the 2002 World Cup. Based on sheer production, Panini World Cup Stickers are the most popular cards in history. Donovan's first sticker card from the heavily-collected line is a great reminder of how young he was when he made his World Cup debut. In 2004, Donruss included a wide variety of cards that recognized famous "Fans of the Game." 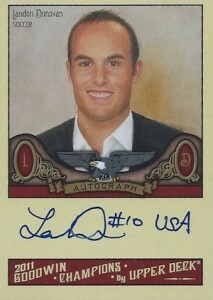 Landon Donovan was featured in Absolute Memorabilia along with several Olympic athletes. While it might seem odd that one of the very first signed cards for Donovan were found in a baseball product, soccer cards had not really become popular in the United States. Although 2006 was ultimately a disappointment for the U.S. World Cup team, Donovan was one of the few legitimate stars on the team. His sticker card is a great budget collectible. What a difference a few years can make. With Donovan leading the way, 2010 was a good result for the U.S. World Cup team and it left fans wanting more. 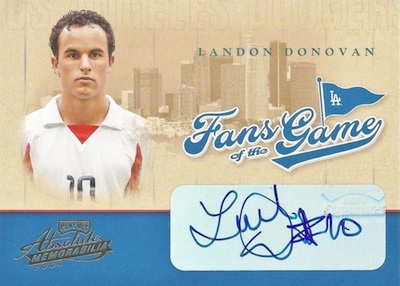 One of the only on-card autographs up to this point, Landon Donovan's 2011 Goodwin Champions rode the wave of soccer excitement following the 2010 World Cup. 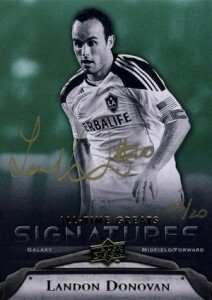 Unfortunately for soccer collectors, most Landon Donovan autographs found in MLS products remain scarce. 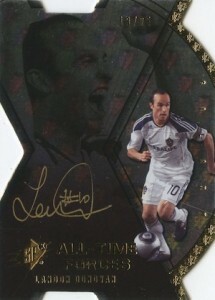 One of several options from the last decade, this 2011 Upper Deck MLS Marks Autograph is limited to 30. Honoring the biggest names across all sports, 2012 Upper Deck All-Time Greats covers 20 elite players with a series of autographs. Although they are each individually rare, all totaled, these Landon Donovan autographs remain somewhat plentiful. The premium designs and on-card signatures in gold ink make the All-Time Greats autographs some of the best overall options for collectors. 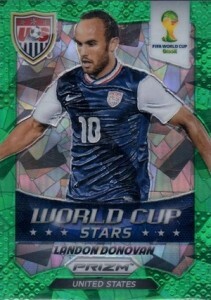 Despite not actually appearing in the tournament, Donovan's 2014 Prizm World Cup cards have remained very popular. Collectors have five different design choices for Landon Donovan and the rare Prizm parallels have produced the strongest values. A sad reminder of what could have been his final sendoff in major international soccer, the final Panini World Cup Sticker card for Landon Donovan elicits a debate that may never be fully resolved. 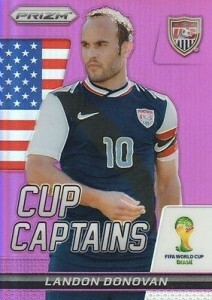 As the final release from his active playing career, the base card for Donovan offers the first Chrome option for the popular midfielder. Like all Chrome products, various parallels present an added chase.